It can be hard to schedule meetings with someone who can’t see your Outlook calendar, like a colleague at another company. You can send a copy of your calendar in an email message so people know when you’re available. Click Home > E-mail Calendar. 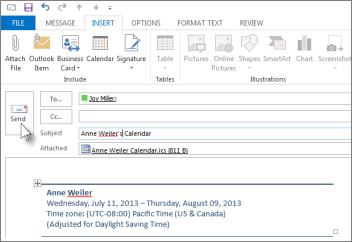 Specify the Date Range for the calendar you want to send. Set the other calendar options you want then click OK.
On the To line, type the name of the person you want to send your calendar. Your colleague can now see your calendar in the message and can open the attached iCalendar (.ics) file in Outlook or another calendar program. Outlook opens an iCalendar file as a new calendar, which you can then view side-by-side with your calendar. 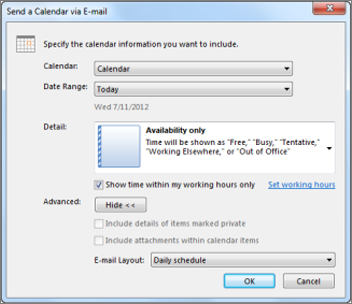 You can drag calendar items from the received calendar to your Outlook calendar.